For four weeks in the winter of 1914, the ANS sponsored an exhibit of Colonial and U.S. coins drawn from all the prominent collectors and dealers of the era. When one views the catalog of that exhibit today, the number of major rarities is simply staggering. Such an exhibit probably could not be duplicated today. Even if collectors and dealers of today would cooperate and allow their major rarities to be exhibited, the cost of insuring such an exhibit would likely be prohibitive. A review of the exhibit and catalog, as interesting as it would be, is beyond the scope of this writeup. The mention of one major rarity would slight another that would be omitted. However, it is important to note that the catalog is organized by area of specialty and interest, and then by exhibitor. There were 27 exhibitors, and needless to say, the list reads like a Who's Who in numismatics from a hundred years ago. One of the exhibitors was H.O. Granberg, from Oshkosh, Wisconsin. Granberg made his name and fortune in the railroad and mining businesses. Among the many rarities he contributed to the ANS exhibit was one in the United States Coins chapter on page 36. Under the Silver Dollars section and San Francisco Mint subsection is: "1870. Only specimen known. No record of issue in the mint. (Illustrated.)" Undoubtedly the 44-year-old Seated dollar was little noticed among the well-known rarities on display. However, one collector who did take notice was Waldo C. Newcomer, another former railroad employee who then rose to prominence in banking. Newcomer had similar collecting interests to Granberg's, and after a theft of his collection in 1913 (and sometime before 1916), he purchased both the Granberg and Heaton collections. Among the coins he purchased was the allegedly unique 1870-S silver dollar. 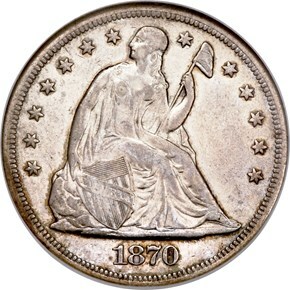 As Nancy Oliver and Richard Kelly point out in "The Saga of the 1870-S Silver Dollar" in the May 2005 Numismatist, after Waldo Newcomer purchased the coin, he exhibited it at the 1916 ANS in Baltimore. 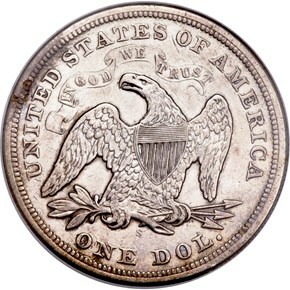 This time the piece was noticed, and The Numismatist reported: "Another excessively rare, if not unique, variety of the silver dollar is the one of the regular die struck in 1870 but bearing the small letter 's' on the reverse, which is shown to most of the collectors probably for the first time, and which to many up to this time has been unknown." The mystery of the 1870-S dollar had begun, a mystery that would remain unsolved until 2005. The explanation of the rarity and importance of the 1870-S Seated dollar is rooted in the building of the San Francisco Mint and the laying of its cornerstone on May 25, 1870. For months it had been known that among the items to be included in the time capsule in the new Mint building would be a complete denomination set of U.S. coins dated 1870. The 1870 dies were received in December 1869, shipped from the Philadelphia Mint to San Francisco--with a couple of important omissions. The gold dollar and three dollar dies lacked an S mintmark. Once the reverse dies were received from the Philadelphia Mint and production began in earnest on all of the coins for the time capsule, it was discovered that there was no obverse die for the Seated dollar. Oliver and Kelly found evidence of a close working relationship between San Francisco Mint Superintendent A.H. LaGrange and Carson City Mint Superintendent Abraham Curry. They theorize that LaGrange asked for and received an 1870-dated dollar obverse die from Curry. Unfortunately, vast amounts of data from the various mints were destroyed some 30 years ago as a cost-cutting measure--we will never know for certain. The speculation is plausible, however, as one telegram survives from Curry to LaGrange, dated March 2, 1870: "I have this day to acknowledge the receipt of silver dollar radius plates, and take this occasion to renew my thanks for your kindness." What exactly 'silver dollar radius plates' are is unknown, but this brief telegram underscores the working relationship between the two mints and the superintendents. Oliver and Kelly also speculate that an S-mint silver dollar would be an excellent memento for the groundbreaking ceremonies. It is logical to conclude that such coins would be unknown to the collecting public, since they were produced under clandestine circumstances, that is, there is no mint record of the production of these dollars. When one examines the roster of the known 1870-S dollar specimens, it appears that is precisely what they were intended for--mementos--and most appear to have been used as pocket pieces. They certainly show evidence of many years' ownership by non-numismatists. Only two of the nine known examples are Uncirculated. Other pieces are scratched, one shows a test mark, another is pitted, and still another tooled. The commonly accepted number of 1870-S dollars produced is 12. In the absence of mint records to back up that number, or any other credible primary source, we are left with nine known examples, another that allegedly appeared and then disappeared around 1990, and an 11th piece that is presumably still entombed in the cornerstone of the San Francisco Mint building. That would mean one other piece is lost, which would bring the total to a nice, round figure of 12 pieces. The 1870-S dollar is a major rarity in the Seated dollar series, and is also one of the premier rarities in 19th century numismatics. It is seldom available in any condition, and usually several years pass between appearances at public auction of one of the nine known pieces. 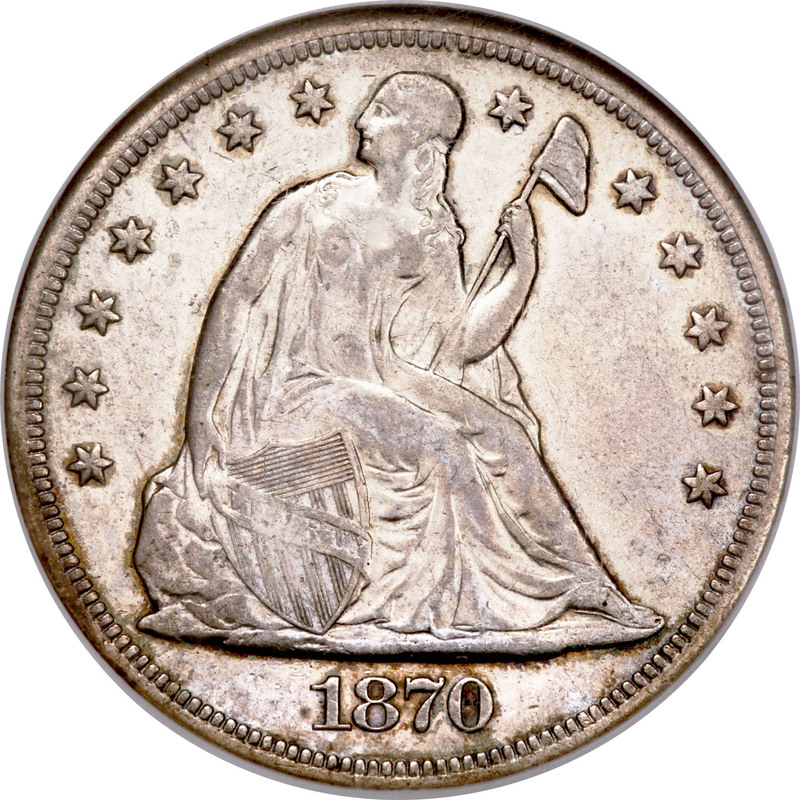 4/22/2008 — 1804 Silver Dollar brings third highest price ever for coin at auction; Heritage Auctions and Bowers and Merena sales achieve record prices in their sales.